Click on a link below to learn more about our campus! Of the eight rooms in the Meeting Room wing of the Parish Life Center, there are five small rooms and three larger rooms to accommodate a variety of space requirements. Buy a brick to help build the Parish Life Center Memory Walk and memorialize someone. The Fellowship Hall of the Parish Life Center will serve our church family in a number of different ways. We will be able to accommodate 450 people at a sit-down dinner, with our fully-equipped kitchen supporting two lines for buffet service. 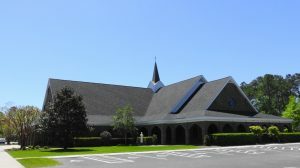 The Parish Life Center has three components—an office complex, a meeting room wing, and a multi-purpose Fellowship Hall. The different sections are separated by courtyards to allow windows on both sides of the one-story office and meeting room wings, and then they are joined together by two entrance lobbies. 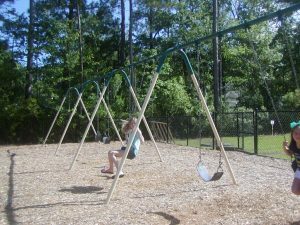 Learn about the features of our brand new playground. With the completion of the Parish Life Center, our Columbarium was moved to its permanent location at the head of our beautiful lake. Spots are still available.